The Lancashire Scouting Lodge of Allegiance No. 6384 has an interesting history as the Lane’s Masonic Records shows. To fill in the gaps – the original Lodge of Allegiance was founded in 1946 just after the Second World War and met at Blackburn Masonic Hall on Richmond Terrace in Blackburn until 1999 when the Lodge moved to Darwen Masonic Hall on Hawkshaw Avenue in Darwen. When Freemasonry hit something of a recession and numbers in Allegiance Lodge dwindled the idea was born to form a Scouting Lodge. Such Lodges are not uncommon and an association has been formed as long ago as 1953 going under the name of the Kindred Lodge Association or KLA for short. The member Lodges List is impressive and contains the name of The Lancashire Scouting Lodge of Allegiance No. 6384 the Lodge name being changed in 2004. 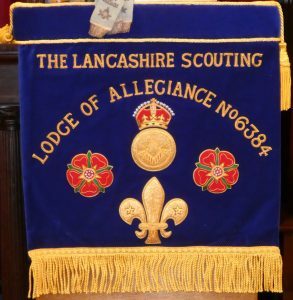 The Lancashire Scouting Lodge of Allegiance No. 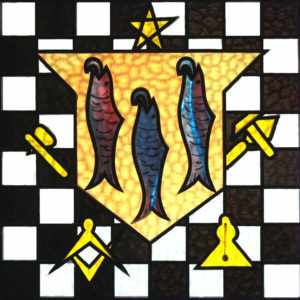 6384 now meets in Whalley on the 4th Wednesday of January, May and August the latter being their Installation Meeting . They also meet on the 4th Wednesday of September at a Masonic Hall in the Province of West Lancashire.